Forge is one of the up-and-coming Finnish metal bands that has a history spanning over ten years back and has been raising their name on the scene little by little. They have even taken care of the crucial step of many metal bands – splitting up once and then reforming. The Path Of Thought-demo was my first touch with the band aside from some snippets heard live and it is a mixed bag of both styles and quality. The music is mostly rocking and mid-tempoish with very much emphasis on the rhythmics in the songs. The proggyness of the players’ influences (you can easily hear the digging of Dream Theater and Meshuggah that the band itself mentions on their site) is very clear in the off-beat riffage that works very well in my mind. The drummer and guitarists have some wicked chops, but they don’t overplay it at any point and keep the melodies in mind as well. I can even sense some jazziness in the leads of Stream Of Life. Some extraordinarily good hooks can be found here and there, especially the tapped guitar licks at the end of Liquid Relief, that reminds me of the two-handed stuff of Joe Satriani. I am willing to bet my bottom dollar that they are courtesy of the skilled fingers of the bands other guitarist, Jyri “Satriani” Kangastalo. I also love the groovyness in Liquid Relief, courtesy of the powerful bass line. The band has had an excellent sense of upping the bass frequencies to pounding levels throughout the demo. Toni Pulkkinen has a strong, slightly deep voice that carries the tunes well. Slight struggling is audible in the highest notes but nothing that healthy gigging and rehearsals won’t fix. Some of the background harmonies remind me strongly of Devin Townsend’s solo stuff. The band plays tightly and there is a definite professionalism present with the technical abilities of these guys. The production is solid and very well-balanced. For a demo, the sounds are great. As already mentioned, much love for the strong bass. Being a closet poet, I can get very picky on the lyrical sides of songs if the time is right. And sad to say, the lyrics are the weak point in these tunes. Just on the face, Sick Game Of Love is about as worn-out and hackneyed as a title can get. It would be different if irony were present but at least at this point I am not hearing it. The two first songs deal with pretty much clichéd melancholy that doesn’t give me any mentionable vibes. Might be because of my rock-hard cynicism, but that is a story not belonging here. Sea Of Lies (no, not a Symphony X-cover) and Liquid Relief handle themselves slightly better. 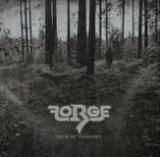 To summarize, Forge is a band that musically has explosive amounts of potential and skills. Some elements in the songs scream even symphonic ambitions that would only require better resources and more studio time. The talent is definitely there, and with effort, along with dropping the “with or without you”-lines, this band can reach bone-crushing powers.